Central Valley Community Bank Staff Members. Farm Bureau members since 2012. The bank was started in 1980 as Clovis Community Bank. We changed our name in 2002 to Central Valley Community Bank. We are a community bank providing relationship banking with great customer service. What kind of discounts do you offer your customers? The bank offers free document shredding to both customers and non-customers on an annual basis. What changes would you like to see happen in Madera that would help benefit your business and/or the community? Not so much a change but of continued support for Madera’s primary industry – Agriculture. Overall CVCB supports over 150 non-profit organizations in the communities it serves. 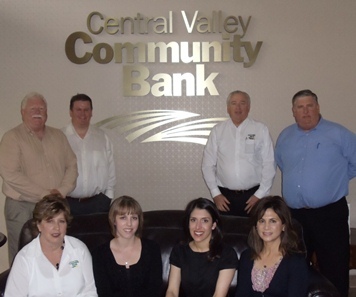 Central Valley Community Bank continues to upgrade our technology with online banking, cash management, and looking at social networking to provide our clients with the financial tools to assist in growing and improving their business. That all the parties involved realize that the state receives sufficient rain and snowfall but lacks the needed storage capacity to be able to deliver that water for all of its recreational, domestic, and agricultural needs. The Farm Bureau News helps to keep the bank informed about our local agricultural economy. Has there been a specific issue that Madera County Farm Bureau has helped you with? Nothing specific but we know our agricultural clients have received assistance with many of the issues they face on a regular basis. It allows the bank to be informed and actively participate in Madera’s agricultural community.